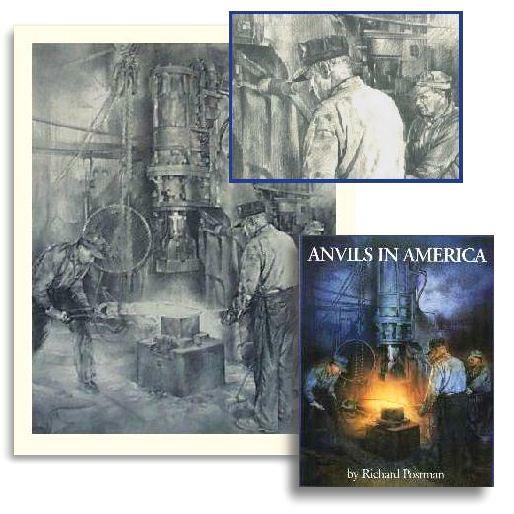 This is an original work commissioned by Richard Postman for Anvils in America. The painting was reproduced in color for the frontispiece of the book and on the slip cover of the second printing (shown above). Limited edition prints are now available from the original pencil drawing. These beautiful lithographic prints are on heavy acid free archival paper in two sizes. Both sizes are numbered. There is a limited number of signed prints. Small 11" x 14" (279 x 356mm), 2,000 total copies. The anvilfire anvil started from a true scale CAD drawing of a friend's 350 pound Hay-Budden anvil. This had a scanned photo of fire, shading and texture added by Patrick Dempsey a graduate of the Savannah College of Art and Design.